The Phillies struck the first major blow of the winter meetings on Tuesday, signing former MVP Andrew McCutchen to a three-year, $50 million contract, with an option for a fourth season. In the process, they established more leverage for the rest of the offseason, while minting themselves as the early leaders in the hot stove's elaborate game of transactional chess. Evaluating McCutchen requires forgetting about the player he was in 2013, when he was a five-tool terror, helping the Pirates break one of the longest playoff droughts in sports. That year, McCutchen hit a huge .317/.404/.508, cranked 21 homers, swiped 27 bases, and played solid defense in center field. McCutchen doesn't have the range to play center anymore. He's gone from being an elite baserunner to one of the worst in the league. And his four-year offensive peak ended in 2015. But he can still hit. Adjust McCutchen's offensive numbers over the past two years to account for the home parks he played in (mostly pitcher-friendly PNC Park and AT&T Park, with a bit of hitter-helping Yankee Stadium in the mix) and he rates as the 18th-most potent outfielder in the majors. Even if we assume some regression as he enters his mid-30s, McCutchen's a good bet to remain an above-average hitter for the life of his new three-year deal, making him a reasonable buy at above $17 million a year on the open market. McCutchen joins a crowded Philly outfield mix that also includes Odubel Herrera, Nick Williams, Roman Quinn, Aaron Altherr, and Dylan Cozens. Any of those other five could become trade bait this winter, as the Phillies work to address other roster needs. Thing is, those needs have been evaporating this hot stove season, one by one. Last season the Phillies ranked dead last in the majors in Defensive Runs Saved, per Baseball Info Solutions. The chief culprit was Rhys Hoskins, the hulking slugger who was horribly miscast as a left fielder in 2018. Trading Carlos Santana away freed up first base, instantly upgrading the team's defense simply by shifting Hoskins to a position where he'll do less damage. That Santana deal also brought back two-time All-Star shortstop Jean Segura. In 2018 Phillies shortstops ranked 27th in the majors in Wins Above Replacement and 27th in park-adjusted offense. Much as the Phillies had nowhere to go but up with last season's defense, acquiring any able body to play shortstop held the potential for a multi-win upgrade. J.P. Crawford (since departed, in the Santana/Segura deal) and Scott Kingery still hold plenty of potential to become quality major leaguers. But landing Segura and McCutchen speeds up their timetable to win, building on a 2018 campaign in which they surprisingly contended into September. They're not done plugging holes too. Catcher was a league-wide disaster in 2018, such that Philly's aggregate .253/.325/.390 clip from that position actually ranked eighth in MLB. But the Phils could find another multiple-win upgrade if they can acquire one of the league's few elite catchers; J.T. Realmuto was the best in baseball behind the plate in 2018, and the Phillies are one of several teams hot on his trail. The Phillies' aggressive moves early in the offseason run counter to the recent trends that have developed during hot stove season. Some of the biggest free agents now have no problem sitting out the market until the eve of spring training, if it means landing the best deal possible. Look no further than J.D. Martinez who didn't sign his five-year pact with the Red Sox until Boston's players had already started taking the field for Grapefruit League games. If that trend holds, any team that decides to make its offseason strategy Harper-or-bust or Machado-or-bust runs a high risk of in fact going bust, assuming lesser available players sign elsewhere earlier in the winter, Harper and Machado choose different suitors, and the game of offseason musical chairs ends in disappointment. 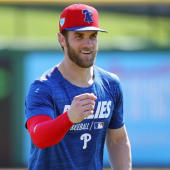 If the Phillies go into next season with Segura and McCutchen, plus Hoskins moved out of the outfield, plus more improvement from Philly's quartet of young right-handers (2018 Cy Young contender Aaron Nola, along with Nick Pivetta, Zach Eflin, and Vince Velasquez),it could be enough to shove the Phillies toward a 2019 playoff berth. Add Realmuto and maybe package some outfield depth and other pieces for pitching help, and the picture gets even rosier. Check off those boxes and add a Harper or Machado, and you can start to daydream about a potential run to the World Series. In a perfect world, one of those two mid-20s superstars becomes the final piece of a championship puzzle. With each shrewd, carefully orchestrated move the Phillies make, they're inching closer to that level.